The Video Below was Narrated & Produced by Tony Cox. 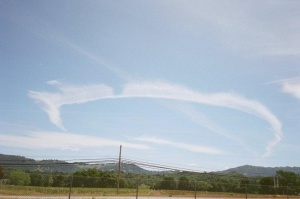 Persistent Jet Contrails Over Marin & San Francisco, California 2001-2002 is a prime example of what many are seeing across the United States and around the word. I highly recommend this 25 Minute documentary which is representative of what many are seeing on an almost daily basis in the skies above us. 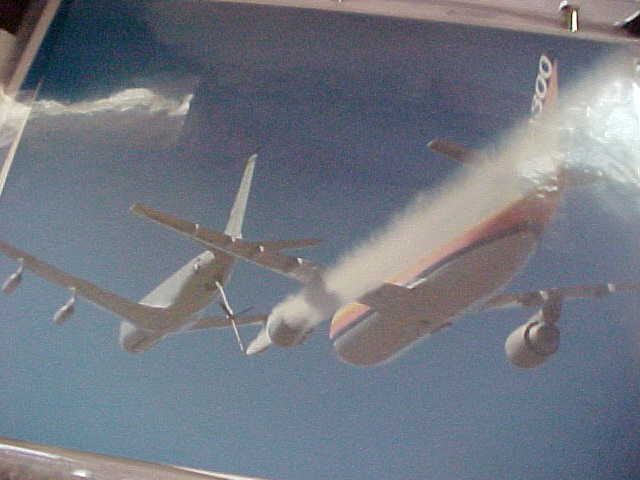 Jet Contrails Over Marin & San Francisco, California 2001-2002. Click on photo to start video. There are many beliefs, theories, and opinions surrounding the persistent jet contrail issue. They all obscure the fact that the jets are real, the man-made clouds and white haze that they produce are real, and that there are serious concerns about the negative human, agriculture, weather, and other environmental impacts that jet fuel emissions and man-made clouds from these jets, produce. Many feel justified in complaining about the jets based only on their beliefs, theories, and opinions without having any direct evidence, that will hold up in a Court of Law…about why the jets are keeping our skies covered in haze and man-made clouds. These individuals and groups have engaged in trying to force elected officials to investigate their opinion-based belief systems since the early 1990s. And they have failed using this tactic for almost twenty years…Twenty years of frustration over a real problem which is getting worse…using old, outdated terminology, has only led to deadends, feelings of hopelessness, and enormous frustration. The Internet, which is a wonderful tool, has become a place where many go to voice their complaints and whine that no one is doing anything about the jet problem. It makes many feel good to whine and complain, to keep pushing their personal belief systems, instead of using the facts. They find it a comfort to find other people that hold the same beliefs and then they all commiserate together. They appear to be complacent with this deadend strategy and unable to move forward and find another tactic that would work to their advantage. The U.S. Air Force and the news media uses and likes these tactics. It is then easy for the media to write a hit pieces on these belief systems while using university professors and others to explain that these beliefs have no foundation in fact and are in reality conspiracy theories and hoaxes. It works to the media’s advantage because it stops our elected officials from investigating what the media labels “a conspiracy theory” or a “hoax” based on belief systems regarding the jets. The first video you will see below was produced in May 2010, and recently aired on Channel 10 News (May 4, 2010), in Sacramento, California. And its title is: “Chemtrails: Are They Fact or Fiction?” I was interviewed for this program for over one hour and the crew traveled for six hours round-trip to make sure that I was included in this interview…even knowing that I don’t ever use the word “chemtrails” in any form and don’t like “hit pieces”. Dave Marquis, the newsman who came with his crew, knew my position on this issue and he knew that I would bring facts to a discussion about the problems with the jets and their persistent jet contrails. He decided that “Chemtrails” would be in the title and peppered the entire narration with terminology about conspiracy theories. He chose one guest who would be the one who would make sure that the program would be about theories and not the facts. I have seen this too many times in the past and found that the public was not well-served by this type of “hype journalism”. The links at the end of the partial transcript provided by Channel 10 News do nothing to enlighten the public about any of the NASA, university, or IPCC studies. I admit I made a serious mistake in allowing myself to be interviewed by a number of radio and television stations in recent years whose full intent was not to take the subject seriously or to really investigate and tell the whole truth…they wanted nothing more than a few mintues of sensationalism…just enough to stop the public from understanding the real issues about the jets and their persistent jet contrails…interested only in “ratings” and fluff pieces…not a real investigative report. The videos presented below are just a few of the ones that were produced that dodged the real issues and played on belief sensationalism which only confuses the public and puts the issue out of public sight until some TV or radio show wants another sensational hit piece for their ratings. Rosalind Peterson was invited by UN Undersecretary General, Kiyo Akasaka to address the 60th Annual DPI/NGO Conference on Climate Change: How it Impacts Us All. The conference was held at the United Nations HQ Sept. 5-7, 2007. United Nations, government, and NGO representatives as well as other influential or expert individuals led two plenary sessions, seven roundtables and thirty-two midday workshops to review the latest scientific evidence on climate change, including its impact on vulnerable populations, water security, land use, and the politics of energy. Did ABC 13 News ask NASA what type of research that they were conducting and who was doing the research? Everyone would be interested in NASA’s answer to this question. Video and photo no longer available. THIS VIDEO COMES FROM KIII A NEWS STATION OUT OF CORPUS CHRISTI, TX. IT WAS RECORDED ON AN IPHONE AT THE PADRE ISLAND NATION SEA SHORE IN CORPUS CHRISTI, TX. WHAT DO YOU THINK IT COULD BE? MISSILE, JET OR UNKNOWN OBJECT. Missile or Jet? * Posted May 19, 2011 at 11:21 a.m., updated May 19, 2011 at 6:19 p.m.
Aircraft over New York City…Notice the Planes with 2 Jet Engines Leave Multiple Trails. Later note Man-Made Cloud Formations. How Aircraft Contrails Form Man-Made Clouds (BBC News) (7.2MB) This series of Satellite Photographs of Military Jet-Produced Contrails that turn into man-made clouds shows how they alter the climate within a short period of time in 2010. MAR VISTA, Calif. (KABC) — Residents of the Mar Vista neighborhood just east of the Santa Monica Municipal Airport said they are fighting for their lives due to the dangerous air pollution from the numerous jets that take off and land at the popular airport. Sunday, residents and local lawmakers were out in force rallying just 500 yards from where the jets take off with strong and dangerous fumes blasting right into the neighborhood. Many who gathered wore masks on their faces to ward off the jet fuel odors and emissions. A recent study out of UCLA <http://search.abclocal.go.com/search/client?st=kabc&search=siteSearch&q=UCLA> showed that the homes and businesses east of the airport are exposed to unusually high levels of air pollution, because winds blow those fumes to the east. In some areas, the emissions of ultra fine particles were 10 times higher than other areas. Protesters said that the problem didn’t start until jets started landing at the airport 10 years ago. Because of its location, the Santa Monica Municipal Airport <http://search.abclocal.go.com/search/client?st=kabc&search=siteSearch&q=Santa+Monica+Municipal+Airport> is very popular with the rich and famous. The airport has proposed reducing the number of jets coming in and out of the airport, but protesters said that still puts lives in danger. “We’d like to see the jets be banned now. The toxicity from those jets with no buffer zone is literally killing our folks in this area. It is a huge, huge health issue,” said L.A. City Councilman Bill Rosendahl <http://search.abclocal.go.com/search/client?st=kabc&search=siteSearch&q=L.A.+City+Councilman+Bill+Rosendahl>. In order to put in a recommended buffer zone of 600 meters, hundreds of homes would need to be eliminated, which is highly unlikely. Protests said that the only option is to ban the jets. They’ve been lobbying in congress, the Santa Monica Municipal Airport and the FAA <http://search.abclocal.go.com/search/client?st=kabc&search=siteSearch&q=FAA> for help. One of the biggest concerns is the idling from jets at the end of the runway. When they’re idle and awaiting clearance for takeoff, the jets blow powerful fumes right into the neighborhood which is located right at the edge of the runway. Interesting video with unknown date, location or origin…Possibly taken after World War I-since there is no date on this video. Does anyone have more information about this black and white movie for verification purposes? Can anyone identify the ship or the airplane in this video?